It’s 6 a.m. In the valley below, about 29 kilometres north of here, Christian pilgrims are undoubtedly beginning to arise and make their way to the famed religious site of Lourdes. But in the restful spa and ski town of Cauterets, huddled among the folds of the Pyrenees Mountains in southwestern France, I’m preparing for a different kind of pilgrimage. The start/finish line out front of the Hotel de Ville is abuzz. My legs feel heavy, my belly awash in butterflies. 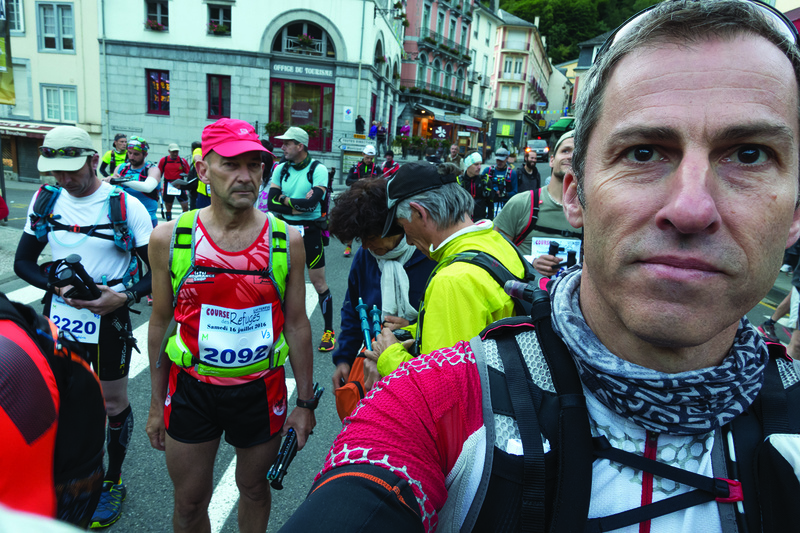 I stand among hundreds of trail runners fitted with packs and trekking poles, nervously milling about awaiting the start of La Course des Refuges. Today’s 40-kilometre foot race, with 2,300 metres of ascents and descents over two mountain passes, isn’t the longest or most notorious trail race in the world, but it still promises to be many things: challenging, a meditation on pain management, but also stunningly beautiful, and a brief passage back to my childhood. Even better, my wife and five-year-old son will be cheering me on at the finish line—if I get there. One thing is painfully missing from this scene: my mother and father were supposed to be here, but the day they were to leave for Europe, my 87-year-old father fell ill and had to postpone the trip. Really, I owe my love of these mountains to them. After all, I first came to the Pyrenees when I was only 10 months old—back in 1969. My father lugged me up the valley in a precarious looking rig strapped to his back (my parents first hiked here in 1962 on their honeymoon). And for most of my life I’ve been coming back here every year or two, so that now this place permeates the deepest recesses of my being. It’s out of this profound appreciation that I’m now bringing my wife and son back for a third time. When the race finally gets underway, it’s like a dam has burst, releasing a sea of runners. I stay near the back of the pack, jogging slowly like I’m in no rush to get anywhere. Is this some trick to psych out my competition? Nah. As a runner with few natural gifts on the cusp of his 48th birthday, I’ve got no plans of winning or even ranking high up (though I may be the first Canadian to cross the finish line this year, given I’m the only one). Snapping a quick selfie at the start/finish line out front of the Hotel de Ville. Quickly the town recedes behind us, and I continue to find myself jogging up the paved road among the last runners. Cars are backed up behind us, while a young guy in jeans jogs beside us, leading a dog on a leash in one hand and holding an old broom in the other. Was this some sort of not-so-subtle hint to us slow pokes? After a few kilometres, we relinquish the road to the cars and start along a narrow dirt trail that zigzags steeply up the forested Vallée du Lutour. Around me, there is some heavy breathing, as runners struggle to settle into their own rhythm. Run your own race, I remind myself. We have a long day ahead in the Hautes-Pyrenees, so pacing, hydration and nutrition are all crucial elements to reach the finish line. That’s not the only thing we have to worry about. The mountains have many moods, and the weather can swing pretty wildly. Hypothermia, dehydration and poor visibility all present potential hazards. Half my memories of these mountains are shrouded in intense fog and epic downpours; the other, the deepest blue skies. In fact, when I last visited here in 2013, Cauterets was still cleaning up after a giant storm had unleashed a catastrophic flood that destroyed houses and swept away several sections of highway linking the town with the valley below. After two hours and 11 kilometres, I trot up to Refuge d’Estom, the first of three aid stations/checkpoints, perched on the edge of a postcard-perfect glacial lake. I gulp down some water and add more H20 to my flasks, before darting off on the next leg, a gnarly 10-kilometre stretch covering 1,400 metres of yo-yoing terrain over two mountain passes. I suspect this section represents the crux of the race. If I can make it up, it’s literally all downhill from there. These peaks and valleys possess an intense familiarity. This is the power of returning to a place again and again. My early impressions, however, are not so much about particular events but rather a feeling of connectedness and vitality that defies time and place: the sound of the cow bells chiming, the strong earthy scent carried on the wind, and the heavenly sweep of the Milky Way overhead while out for a midnight pee. As I speed hike up the mountain, pushing against gravity, I feel as if I’m also carrying my father with me. I stop often to photograph and document the experience, knowing that I’m serving as his proxy, and he’ll want to see everything that I’m seeing (already I’ve been emailing him regular updates with photos from his favourite spots in southern France). The region’s stunning beauty has kept three generations of Brodeys coming back year after year. Soon the last of the trees fall away, and we enter the grassy moonscape with a clear view of a dozen or more summits. These are not the epic soaring peaks of the Andes or the Himalayas, but to me, they are perfect in every way possible. 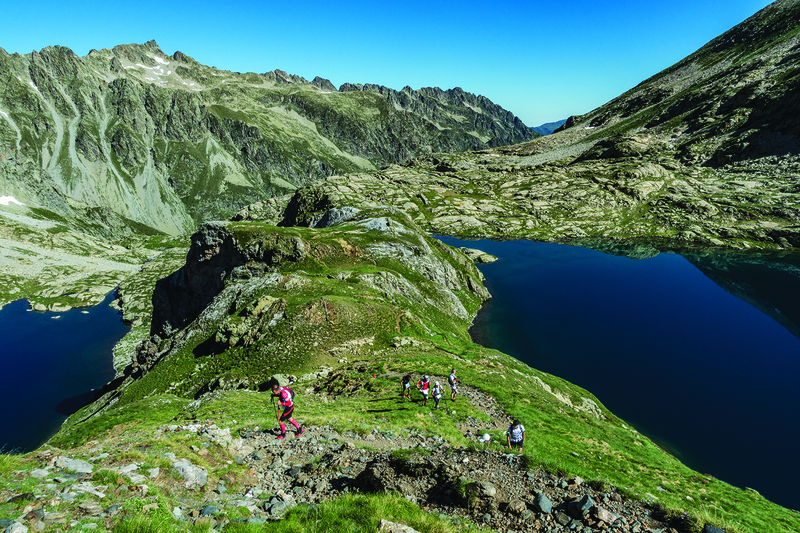 Like these mountains, La Course des Refuges is a human-scale race, which doesn’t require superhuman strength to complete. This race isn’t the longest I’ve ever run—that was the 82-kilometre Meet Your Maker ultramarathon in British Columbia—but with age and stage my priorities have shifted, and I’ve begun adjusting my goals accordingly. By resetting expectations, I’m giving myself permission to be less ambitious, to suffer less and enjoy more, so that I can keep doing these sorts of adventures for years to come. My job is to keep those voices in check, to filter what information is actionable, and what is the brain’s way of telling me that it would rather be chilling on a beach. Still, when I quiet my mind, the thing I notice most is the blissful silence, which actually rings in my ears, reminding me just how noisy my life usually is. I arrive at a rocky traverse that has been rigged with a rope for safety. Perhaps in another circumstance, I would have paused to size up the risk (minimal), but on race day, I have tunnel vision and move speedily through. With 17 kilometres now under my belt, I arrive at the Col des Gentianes (at 2,729 metres), sweating buckets but feeling good, having remained in my comfort zone. Across the gaping valley, I see the mighty granite walls of the Grand Vignemale, the highest summit in the French Pyrenees (at 3,298 metres). Nothing like a bit of family support in the French Pyrenees. I catch sight of a tiny black fleck across the way and immediately realize that that is the Refuge de Bayssellance, the next checkpoint. My heart sinks with the recognition that I need to hike all the way to the bottom of the valley and then climb all the way back up. Yes, I had seen this feature on the race map, but the reality is far more dramatic and demoralizing. of the course don’t accurately portray the landscape. I feel his pain. After all, I was hoping to make up for my slow ascents by running downhill, but the topography is far steeper and more technical than I imagined, requiring a careful descent for all but those human mountain goats dominating the front of the race. 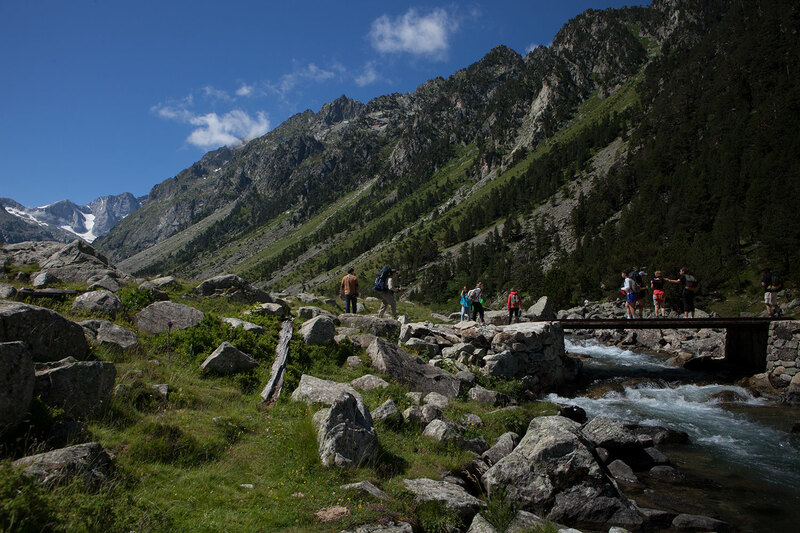 On the climb toward the second checkpoint, the second largest glacier in the Pyrenees, the Glacier d’Ossoue, goes by almost completely unnoticed. I storm through the checkpoint, which looks something like a retro space-age capsule with solar panels, staying only long enough to refill my water bottles, and head up the final metres to the col (it seems to be the only way I make up any time on the course). Then the continuous downhill begins. Right away, my hot feet give notice, and it doesn’t take long before I feel like I’m running on bubble wrap, blisters forming from the relentless pounding on the rocky ankle-twisting terrain. For the next 10 kilometres, I seem to do a dance with 20 or so other runners, passing and then getting passed by them over and over again. 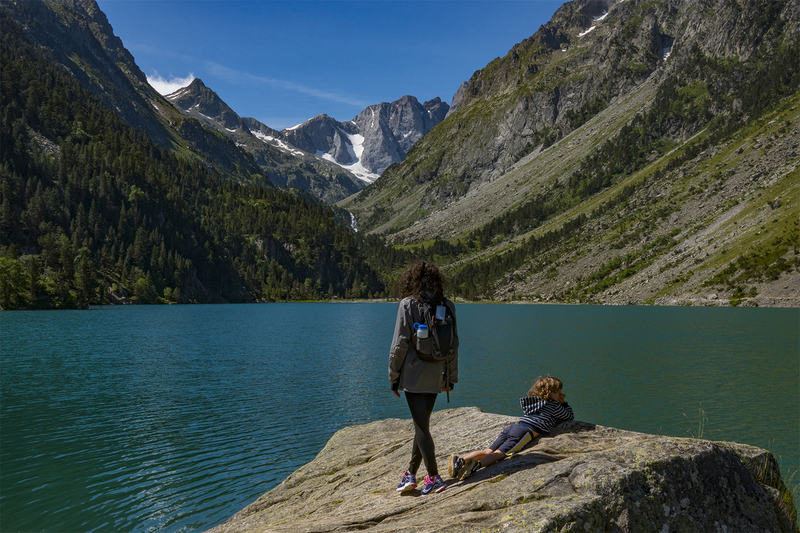 In the distance, the magnificent waters of Lac de Gaube sparkle. This is where I had hiked a few days previously with my wife and son, and where my sister Michelle had gotten engaged some years back. I see family stories everywhere in the landscape. “Bon courage!” Even tweens offer it up without rolling their eyes. 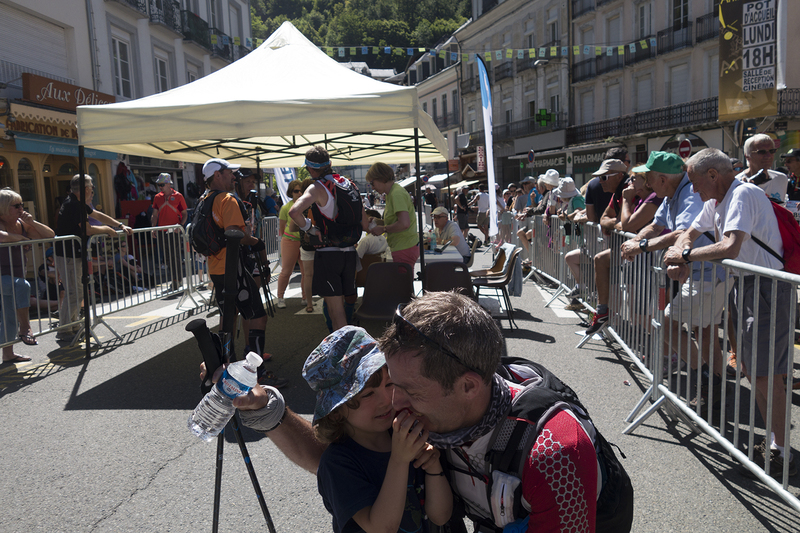 Robert’s son, Sevan, runs into his father’s arms at the finish line. I leave the open sky and enter the forest leading down the valley. The ground beneath my feet moves fast, as I sense Cauterets approaching. For the last three kilometres I run continuously, the dirt path smooth and easy. I pass a few running compatriots, who have been reduced to walking. I encourage them to jog with me. They start to run but quickly fall off the back, despite my modest pace. I can see the rooftops of the town and pick up speed, until I arrive at the main strip and make a sprint for the finish line. My son, Sevan, runs into my arms, while my wife beams. I regret that my mother and father aren’t with us to celebrate, but I know they are happy that the Brodey tradition continues in these mountains and that it’s now being passed along to another generation. With my pilgrimage complete, I call home to my mom and dad. My pops sounds remarkably well and speaks only in passing of his own health issues. He is enthusiastic that I should be there, in one of his favourite places, asking how I felt during the race and about what places I passed along the course. I truly thought I would see him again. But life is short and precious, and after so many experiences and great adventures, my dad’s time had finally come. He died three days later, on July 19, 2016. In other words, on to the next adventure.